Today is 25L Tuesday and I have something sweet for you. 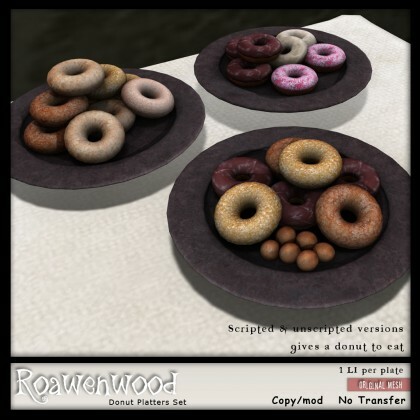 Literally… I made donuts! So why is it we are having donuts this week? Well I have something of a story…. My other half and I tend to talk… a lot. Sometimes hours on the phone just for the sake of and no real particular reason, we just do…. so we’ll be talking bout his work, my work, whatever comes up and a conversation may go something like this…. Me: I want to make something new for 25L this week, what do you think would be decent or a good idea? I’m tapped out at the moment. Me: Thanks I think, guess I’ll keep thinking. This said because this is like a default response from him, at this point I’ll change the subject mulling over what the hell I feel like making or something to do. Well this week we had one of these little exchanges so I decided to hell with it… this week we’re making donuts! Soooooo I made doughnut platters, they actually turned out looking suitably yummy. The picture here really doesn’t do them justice, but it was late and I was done. *laughs* The pack comes with THREE different plates filled with sugary sweetness. Frosted, unfrosted cake type, and one of them even has some of those lil glazed doughnut holes. I included scripted and unscripted versions. Scripted versions will give you a donut to eat and enjoy. Unscripted obviously don’t do anything, they’re just to look pretty. ONLY 1 LI for each plateful. TODAY and tomorrow I’m leaving them up in the 25L vendor. So enjoy! BEST part is… these don’t have any calories! At the main store landing in specially marked vendors. ← Hump Day Happenins — Reborn?